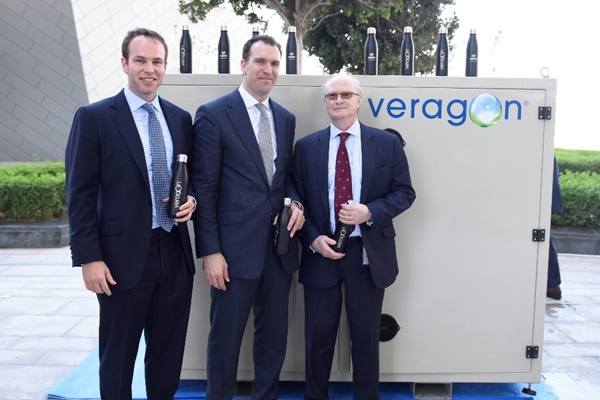 UK-based Veragon Water Solutions has commercially launched a pioneering technology that provides a cost-effective and sustainable source of mineralised drinking water by harnessing the humidity from the air, in the Middle East. Veragon Water Solutions’ innovative air-to-water system provides potable water in hot or tropical environments and has been used by its customers, including the Italian Armed Forces, United Nation's World Food Programme and North Atlantic Treaty Organisation (Nato), in some of harshest climates in the world, said a statement. The incredible technology has now arrived in the UAE through Veragon Water Solutions Middle East Ltd, a partnership between Eshara Capital and Veragon Water Solutions, it said. The firm unveiled its water solution to VIP delegates during its official launch event at its new headquarters at Abu Dhabi Global Markets, it added. Veragon Water Solutions was founded by Dr Alessio Lucattelli, an Italian medical doctor who began researching the idea of Air-to-Water technologies after taking part in relief work in Haiti. One of the major problems faced by him and the aid organisations was the lack of access to safe water to drink or to clean vital medical equipment. After successful trials, the process of water capture was developed and expanded on a commercial scale. The result is Veragon’s pioneering ‘Air to Water’ system, which has the capacity to produce up to 1,000 litres per day and can produce safe drinking water at the point-of-use for as little as Dh0.03 per litre, said a statement. The water produced by Veragon’s Air-to-Water systems is certified to World Health Organization Standards and it has been approved for use in the GCC region. “Furthermore, the ecosystems in the world’s oceans are under threat from the immense amount of waste from single-use plastics; our technology provides a viable alternative to bottled water without compromising on quality,” he said. “In a world where this precious resource is under increasing pressure to cater for the ever-expanding global population, mankind must find new ways to source what we need to survive and in turn help protect our environment,” he added. Many industries in the region could benefit from the ‘Air to Water’ system, which vastly reduces their reliance on current water supplies which come from limited natural resources, or from desalinated sea water. Veragon units offer a credible and commercially viable alternative water production methods.